Digital videos are present in a number of formats and MPG is one of the most popular among all. MPEG (Moving Pictures Expert Group) video is a group of video compression standards that are developed by the MPEG which is a working group of the ISO. The algorithms of MPEG videos are designed in a manner so that they can be easily transmitted and decompressed. The MPG files have good video quality even at high compression rates, and thus a large number of these files are present on your PC. If you want to play these MPG files on your DVD player, you would need to burn them to a compatible format and here a need for good MPEG to DVD converter arises. There are no dearth of programs, software, and tools to convert MPG to DVD and for the best solutions, go through the following part. Burning MPEG4 to DVD requires professional software that is fast and results in the good quality video. Wondershare UniConverter (originally Wondershare Video Converter Ultimate) is one such program that fits all the criteria of a perfect MPG to DVD converter. The Wondershare software works as a complete video toolbox taking care of all your needs related to burning DVD and Blu-Ray, conversion, transfer, download, and editing. 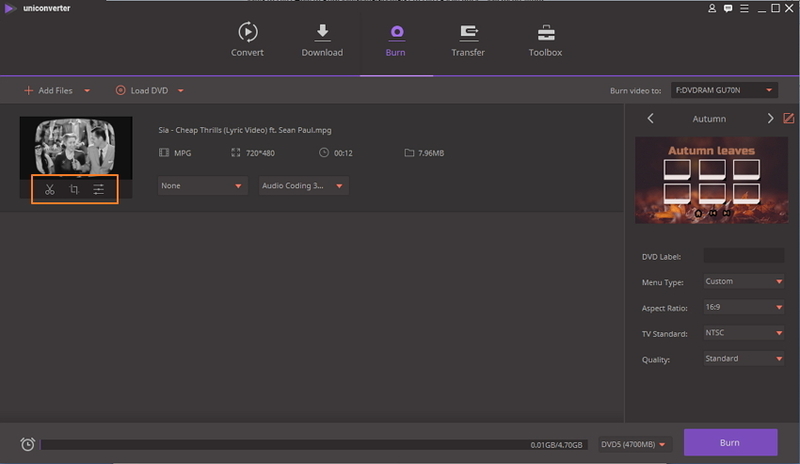 This mpeg4 to DVD converter free download is available for Windows as well as Mac system. Supports burning an array of formats to DVD compatible VOB files. Burn HD and FHD videos to DVD folder, ISO files, DVD, Blu-ray disc. 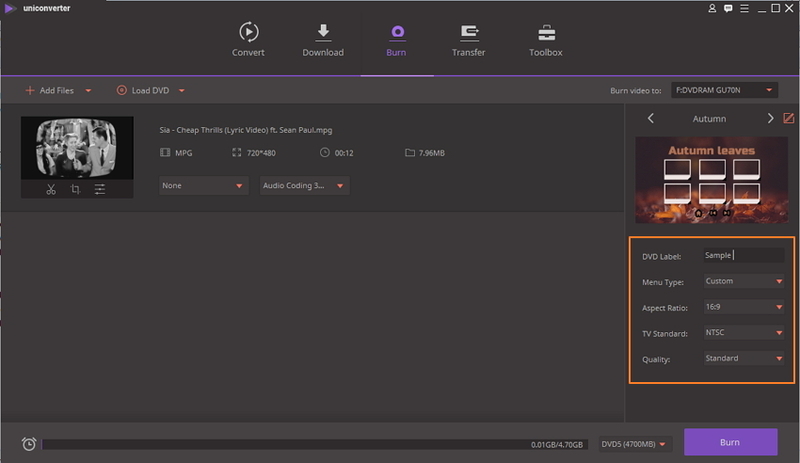 MPEG to DVD burning can be customized using built-in editor. 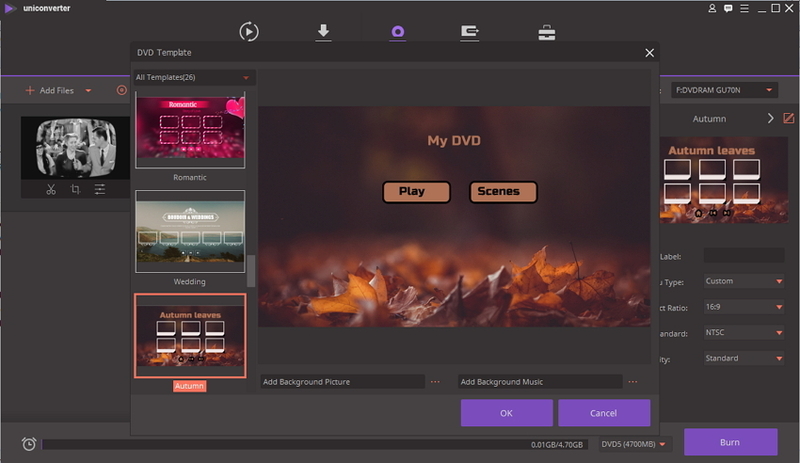 Allows to burn MPEG to DVD at a fast speed and comes with free DVD Menu templates. This MPEG to DVD burner features real-time preview to check for the adjustments. Step 1 Load MPG files to the MPG to DVD converter. 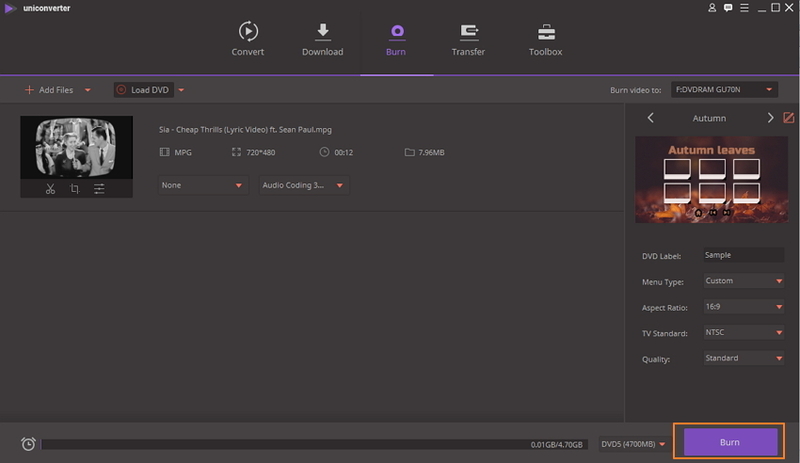 The very first thing is to download and install this MPEG4 to DVD converter on your PC or Mac. Next, launch the program and select the Burn tab from the main interface. Now to add MPG files from your PC, click + Add Files and browse for the desired files. Alternatively, just add files by drag and drop. Videos can be edited by selecting one of the editing icons under the added video thumbnail. Step 2 Select DVD Menu template and customize settings before MPG to DVD conversion. 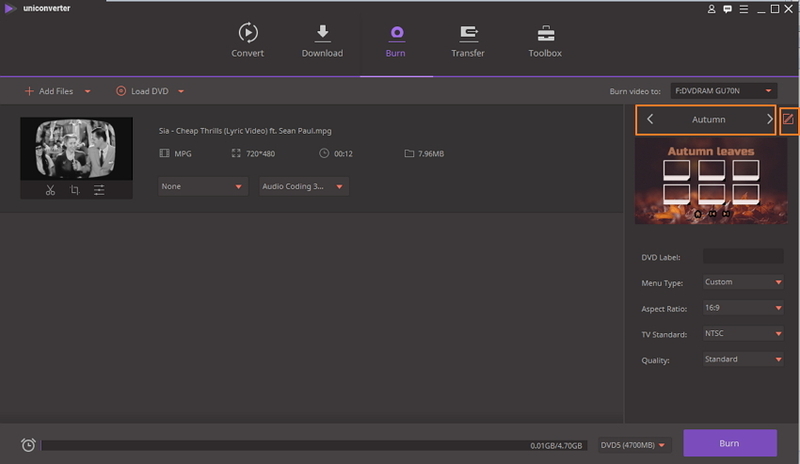 The right panel of the interface shows the DVD menu templates. Move the right and the left arrow to check the template design through thumbnails. 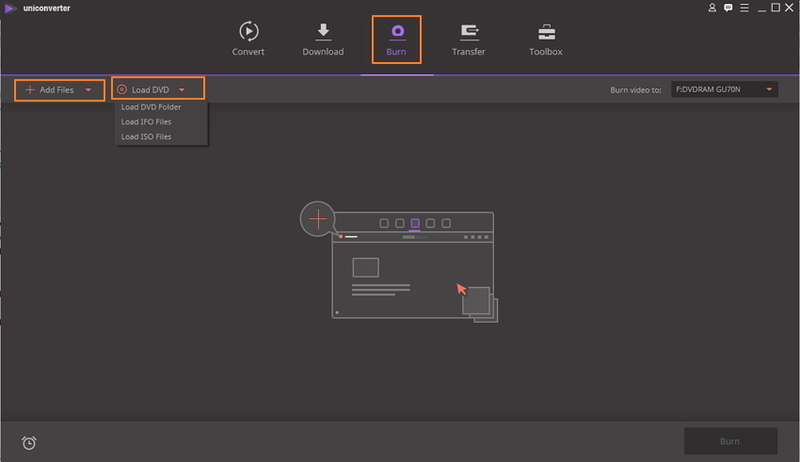 To browse for more template designs and edit the selected template, click the Edit icon in the top-right corner. A new window will open with more designs. Here you can also add background image and music, design your DVD title, etc. The next step in MPEG4 to DVD conversion is entering the DVD label and selecting other video parameters like Menu Type, Aspect Ratio, TV Standard, and Quality through the drop down menus. Step 3 Convert MPEG4 or MPEG2 to DVD. At the final step, hit Burn to start the MPEG4 to DVD or MPEG2 to DVD conversion process. With Wondershare MPG to DVD converter, you can get good quality DVD in just a few simple steps. MPEG is a short form of Moving Pictures Expert Group which is a group of working experts that was formed by ISO and IEC in the year 1988. The group was formed for the purpose of setting standards for video and audio compression and transmission. Talking in general reference MPG and MPEG is the same thing and the difference lies just in the name- .mpeg and .mpg. Originally the file extension for MPEG was .mpeg and for Windows, it was used as .MPG as Windows files needed a 3 letter extension. There was no restriction for the Mac system and thus .mpeg is used by Mac users. Later, with the update of the OS, Windows also started accepting .mpeg extension. Presently, .MPG is the commonly used extension for Windows as well as Mac system to avoid any confusion. MPEG2 and MPEG4 are the codecs which are used for video and audio compression standards. Talking about the difference between the two formats, MPEG2 was developed in the year 1995 and is commonly used for Digital TV broadcast, VCD, DVD, and other discs. Lossy compression methods for file size reduction are used. MPEG 4, on the other hand, was developed in the year 1998 with the purpose of higher compression and lower bandwidth for having a high-quality image and audio quality. Overall MPEG 4 has higher compression with smaller file size and thus more versatile as compared to MPEG 2. So when you want to convert MPEG to DVD, simply install Wondershare UniConverter (originally Wondershare Video Converter Ultimate) and in no time you will have a good quality DVD.